Six to seven hours strenuous mountain hiking. This spectacular trail steadily rises from sea level to 634 metres (2080 feet) above sea level. It is a strenuous hike which richly rewards those who take it on. 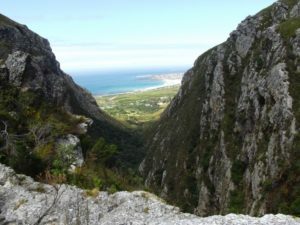 The trail of approximately 9 kilometres (5.5 miles) takes hikers over four mountain peaks offering stunning views of unspoiled mountain scenery to the north, to the south, the village of Kleinmond and the ocean far below, to the east the wide expanse of the Bot River-Kleinmond Estuarine System, and to the west, the Palmiet River and mountains that sweep down to the sea. The trail passes through pristine mountain fynbos in the heart of the fynbos biome. In September the famed Proteas, Ericas, Restios and Geophytes (bulb, rhizome and corm forming plants) that make fynbos famous are at their best. There is no technical rock climbing, but there is some exposure to height. Depending on the fitness levels of the party, the trail takes six to seven hours. Sturdy hiking shoes or hiking boots, sunhats, clothing suitable for changeable weather, as well as water, drinks and trail food are essential. About five hours moderate mountain hiking. This justly famous trail is a moderate to strenuous hike from Oudebosch in the Kogelberg Nature Reserve, across the eastern flank of the Voorberg/Elephant Rock Mountains to the finish in the Harold Porter National Botanical Gardens in Betty’s Bay. Although the trail is only 7 kilometres (just over 4 miles) long, the altitude ascent and descent and the winding path makes for slow going and takes about five hours. 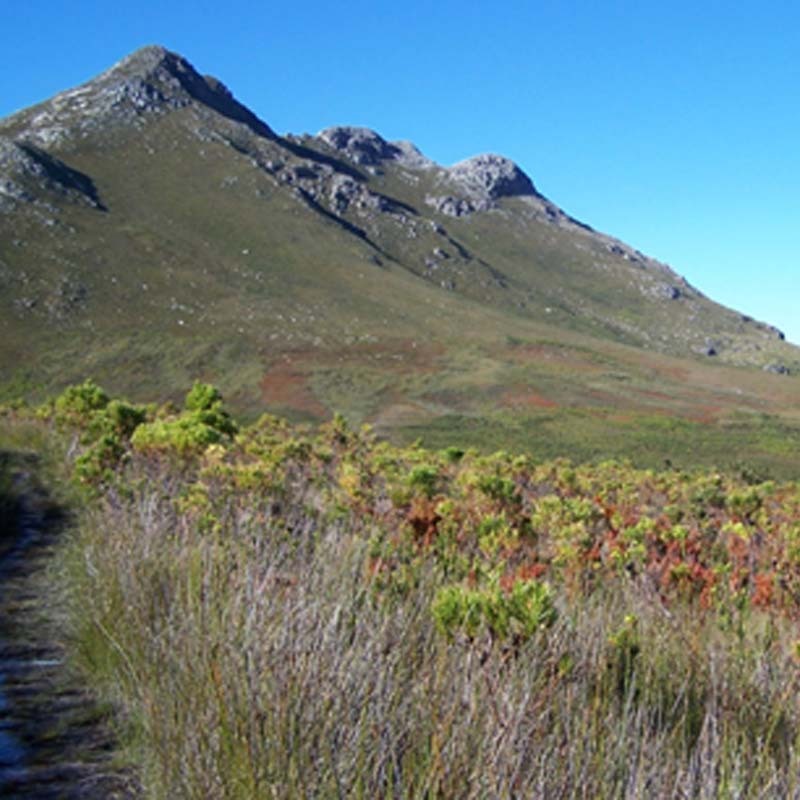 The trail passes through a relict Afrotemperate forest, the eponymous ‘Oudebosch’ (‘Old Forest’), through which the picturesque whisky coloured Oubos River flows and then enters pristine mountain fynbos far from any sign of human habitation. The vegetation is rich in endemic plant species seen nowhere else on earth, interspersed with extraordinary rock formations and towering mountain scenery. The trail descends the northern side of the spectacular Leopard’s Gorge via the steep ‘Zig-Zag Path’ into the Harold Porter National Botanical Gardens far below. 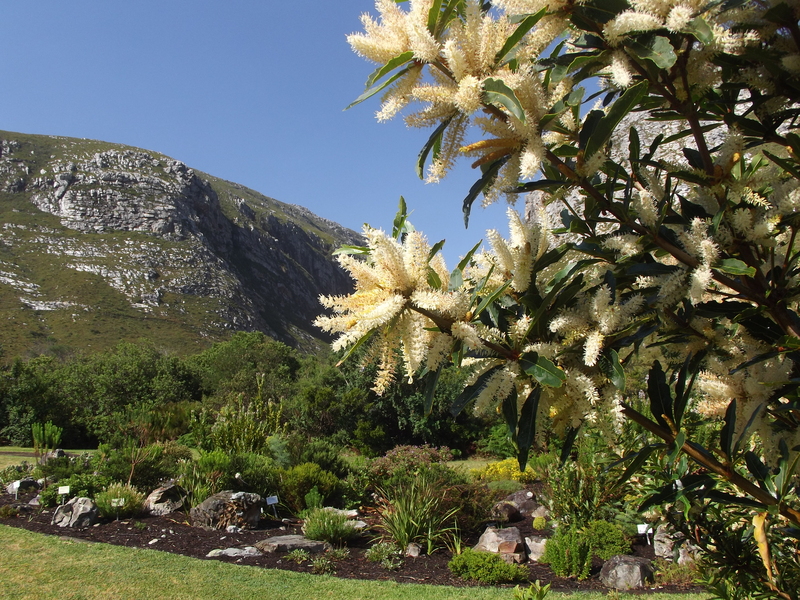 The Gardens showcase various types of fynbos and other vegetation of the Cape Floristic Region and offer a tranquil end to a true mountain experience. 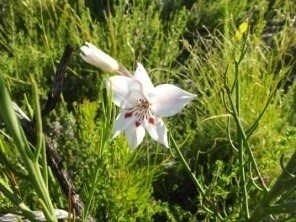 The Red Disa Restaurant in the Gardens provides thirsty hikers with much needed refreshments. Sturdy hiking shoes or hiking boots, sunhats and clothing suitable for changeable weather, as well as water, drinks and trail food are essential. 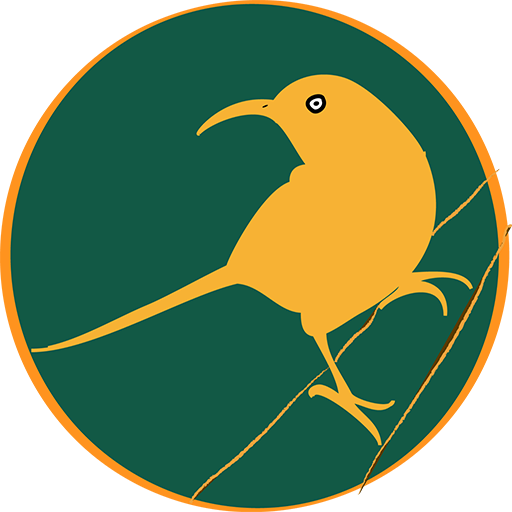 Motor transport to the start at Oudebosch in the Kogelberg Nature Reserve and from the finish at the Harold Porter National Botanical Gardens is required. Five to six hours of moderate to strenuous mountain hiking. 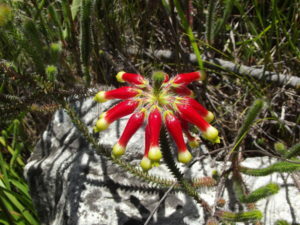 This mountain trail takes hikers through fields of spring flowers in September, from barely 20 metres (66 feet) above sea level to the summit of the majestic Perdeberg, the highest point in the Kleinmond Mountain Nature Reserve (679 metres, 2228 feet above sea level). After briefly passing through a small patch of Afrotemperate and riparian forest called ‘Feetjiesbos’ (Fairy Glen), the ascent is in alternating stages of easy and steeper gradients through three different types of fynbos vegetation, Hangklip Sand Fynbos, Western Coastal Shale Band vegetation and Kogelberg Sandstone Fynbos, each with their characteristic flora. The Western Coastal Shale Band vegetation section experienced two wildfires in the summer early in 2017. 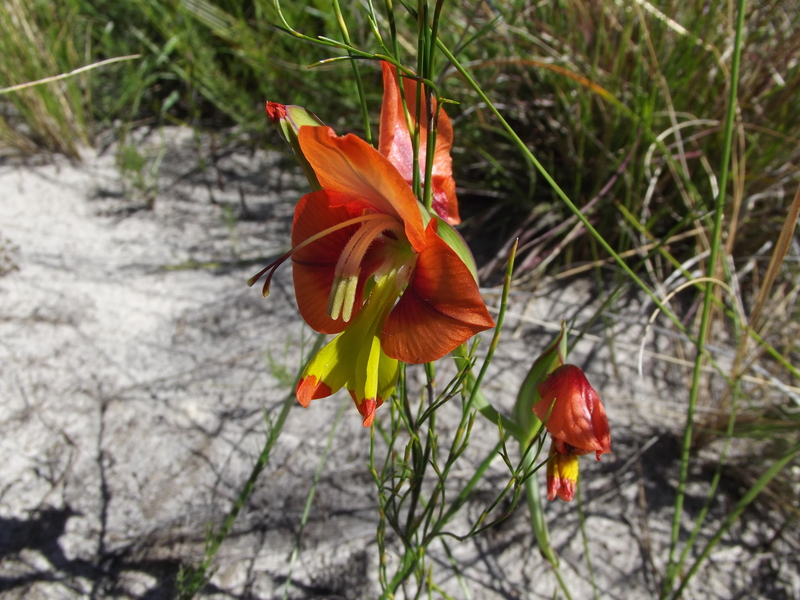 Since wildfire stimulates new growth in fynbos, especially of spectacularly flowering geophytes (bulb forming plants) such as Watsonia, Gladiolus, Aristea, Pillansia and also many Ericas (Heath), and now is the ideal time to explore this route. There is no technical rock climbing or scrambling on the route and exposure to heights is moderate. The route is ‘out and back’, providing hikers with new views on the return leg of the journey. Sturdy hiking shoes or hiking boots, sunhats and clothing suitable for changeable weather, water, drinks and trail food are essential. Four hours of moderate to strenuous mountain hiking. Hangklip Peak marks the eastern end of False Bay, so named because mariners in centuries gone by would sometimes round Cape Hangklip with its famous Peak and mistakenly imagine they had rounded the Cape, only to discover that they had entered this magnificent bay. From Hangklip Peak hikers are able to see, far across the broad expanse of the bay, the whole length of the Cape Peninsula, from Table Mountain to Cape Point. 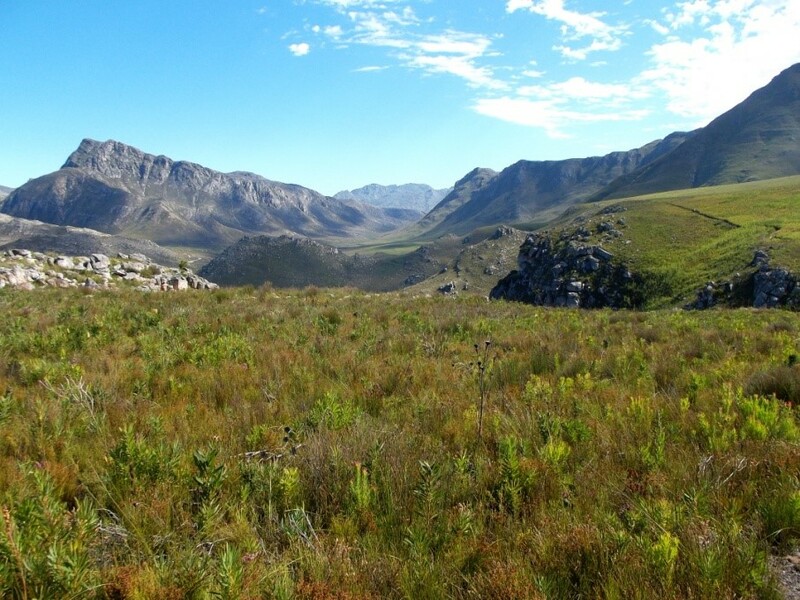 ‘Hoerikwaggo’, meaning ‘the mountains in the sea’, was the name Khoi pastoralists gave to the mountains of the Cape Peninsula. Other ancient mariners dubbed these mountains in the sea ‘Adamastor’, the mythical sea god, resting on his side in his watery realm. From Hangklip Peak hikers are able to see what they meant. 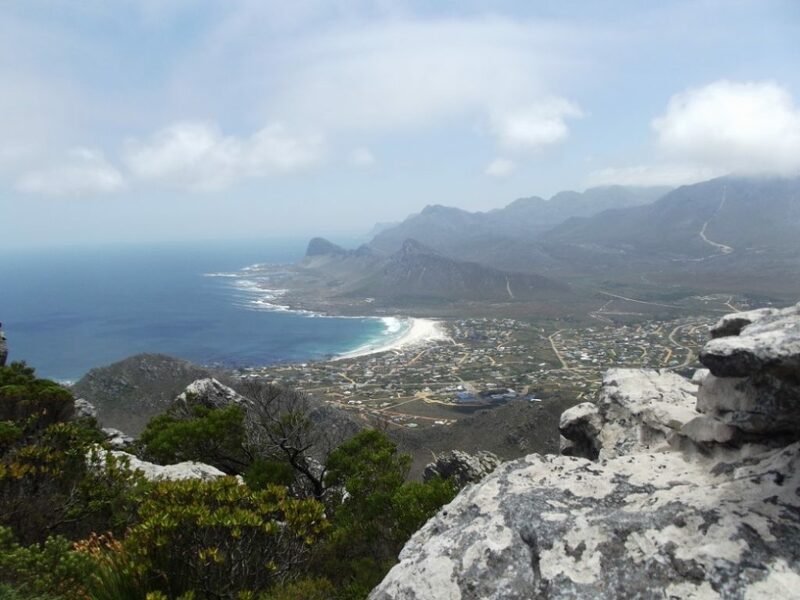 The trail ascends from just above sea level to 454 metres (1453 feet), offering spectacular views over Cape Hangklip and its well-known lighthouse far below, and the Atlantic ocean, which some argue is really the Indian ocean. That’s a discussion to have while on the trail, there are compelling cases to be made for both opinions. 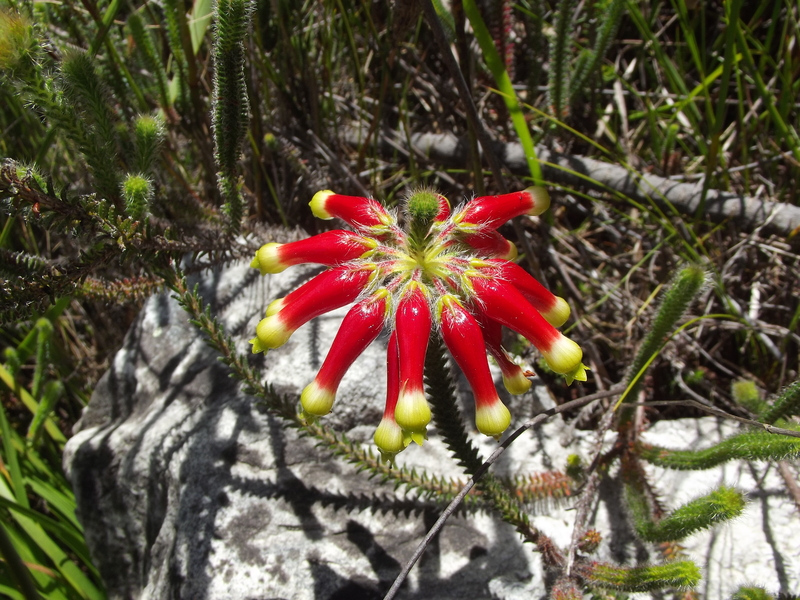 Hangklip Peak is home to many species of Erica (Heath) and endemic species of flowers of the family Peneaceae that occur nowhere else on earth. Chacma baboons are also present, but pose no threat to hikers who respect their right of residence. The trail begins and ends in the seaside village of Pringle Bay where several coffee shops and restaurants provide welcome refreshments.